If you are studying history, you should go in order from the beginning of time to the modern age. You can cover the sciences in any order, but there are some science topics (like simple machines) that are harder than others (like birds). Do the sciences from easiest to hardest. Most science topics are easy, though, when taught from living books and hands-on projects. So start with a science topic your kids are interested in, and progress to every other topic systematically. You can also do a unit study around a novel in literature. Pick a book that will serve as a spine for your study, or choose many shorter books from the library. You can get pre-made curriculum that will get you through the whole unit, or you can get simple library books that you can read one by one. If you grab 20 library books about ocean creatures, don’t read all of them unless you really want to. Instead, choose maybe three excellent ones, and use the other books for reference, for hands-on projects, or for looking at the pictures. When you open the books, ideas will come to you for how you can bring the topic to life. At the minimum, you can watch DVD’s from the library about that topic, and try to find a field trip that will cause that topic to come to life. You can stop there if you don’t have enough energy for crafty things. Depending on the ages of your kids, they can do all kinds of science and art projects on their own. 1. Owl Unit Study: If you take a look at how I put this unit study together, I started with an overview of owls by showing a video. I encourage parents to check out owl books from the library. To bring the study to life, I encourage people to observe owls in the wild. If you want your children to do a formal study, you can make a lapbook about owls. Or if you prefer to do notebooking, you can color and cut out owl coloring pages, and glue them into your notebook with a description. Then you can have some fun with the topic of owls by making owl puppets or owl cookies. You can finish your study with a dissection of an owl pellet. 2. France Unit Study: We started out by gathering books from the library about France. I embedded a video tour of Paris and of the Eiffel Tower. I threw in some crafts, including a picture of my son’s Eiffel Tower he made out of K’nex. We made an outdoor French cafe in our backyard, and we ended with some French recipes. 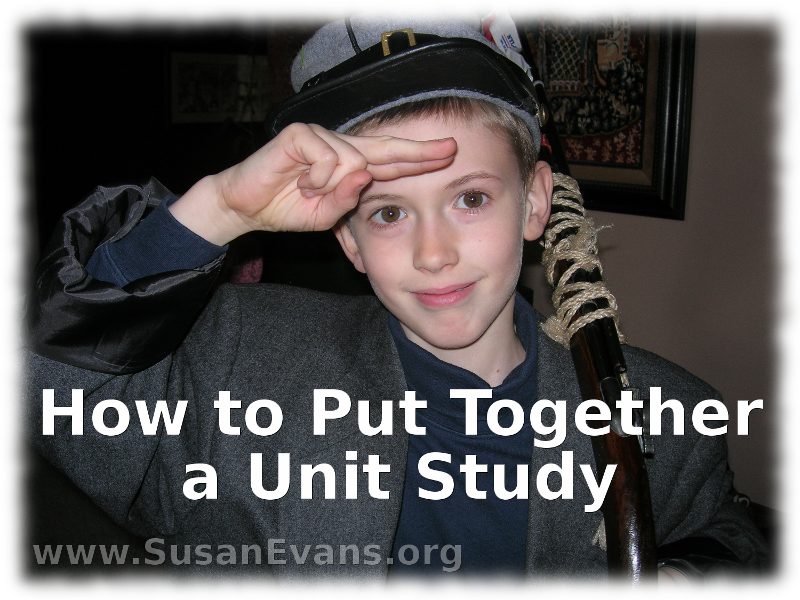 I’ve pulled together hundreds of unit studies with thousands of resources to make unit studies a delight in your homeschool. Join the Unit Study Treasure Vault today! This entry was posted on Friday, July 25th, 2014 at 8:00 am	and is filed under Homeschooling. You can follow any responses to this entry through the RSS 2.0 feed. You can skip to the end and leave a response. Pinging is currently not allowed. I absolutely love using unit studies with my kids because we have fun while we are learning! It’s the most effective way to teach something because you’re immersed in the topic! Loved your series on unit studies! What an awesome way of teaching and making learning fun for all! Can you tell me how long you spend in a unit study? Your owl unit for example, how long would you spend on that study? I don’t want to go through a unit too fast or too slow. Not sure what the typical pace is for a unit study. Thanks! The length of a unit study depends on the topic. For example, you might study owls for one week or one month depending on how in-depth you want to go and what other topics you wanted to cover that year. We studied Medieval Times for a whole year, so unit studies can be any length.